Yesterday was a busy day; I spent about six hours shopping consisting of clothes, house, and food shopping. I made the mistake of going to the Metro Centre, a large indoor shopping complex, supposively the biggest in Europe. The Metrocentre on Saturday afternoon is usually a big no-no as it's filled with too many people, and it feels as though like being in a rabbit warren. 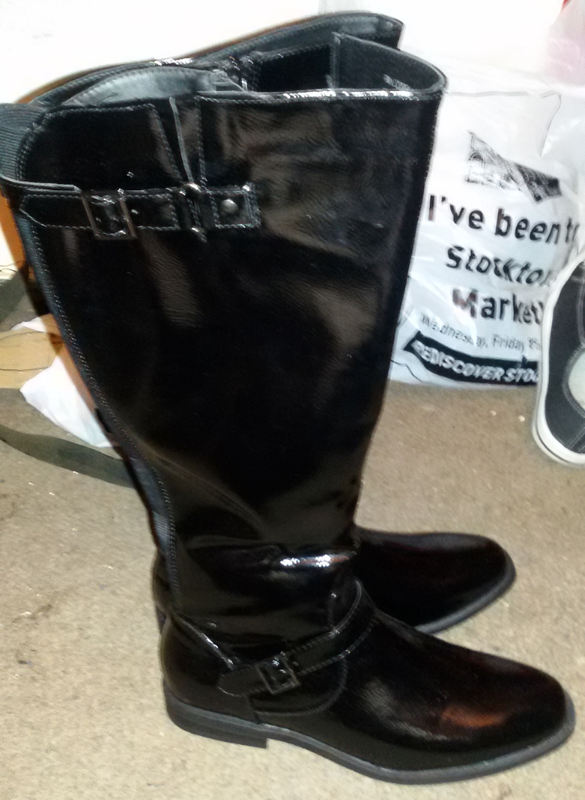 However, the allure of a pair of knee high PVC boots was too tempting. The night previous, I nipped into Primark to purchase more leggings, as my other ones have appeared to vanish, possibly the fairies have borrowed them, but for three-pound a pair I am not bothered. I ended up wandering into the shoe department and found a gorgeous pair of PVC knee high boots. 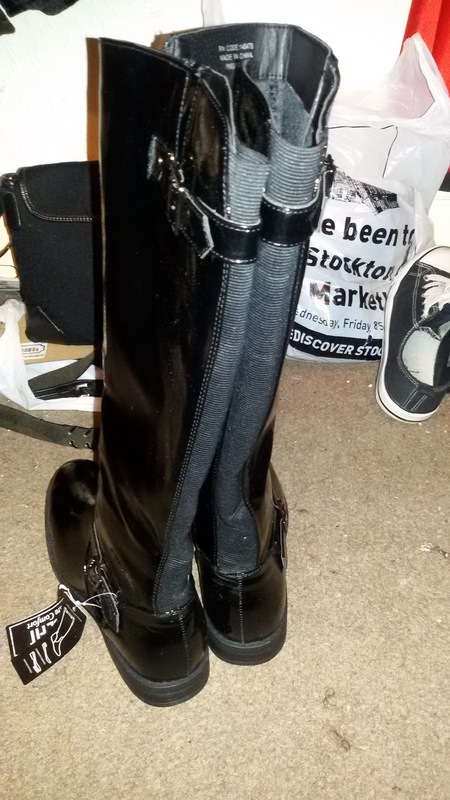 I tried them on as they even fitted my wide calfs, I love knee high boots but because of my muscular calfs it's a nightmare to find wide fitting boots. I grabbed and raced to the checkout, and in my excitement I picked up a size nine, I thought they were referring to an American size 9 or a UK size 7. The sale assistant recommended to call the Metrocentre store the next morning, and I called the store and after ten minutes of the most irksome music I got confirmation they had my size. During the same morning, I managed to break the boyfriend's toilet seat that was already on it's last legs, so I decided to go Ikea for a new one. To replace the seat involved combined efforts of the boyfriend and me to decipher instructions or rather me unable to understand the instructions and I had to ask for the boyfriend's assistance. 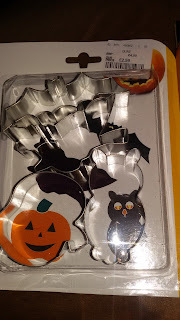 If I go to Ikea, I love to walk around to spy stuff and grab a bite to eat, I only left with a toilet seat and a pack of delicious meatballs for tea. Before I left, I knocked on my boyfriends new upstairs neighbour whose is lovely, and we're fostering good relations. I knocked on her to offer a pair of leggings I bought from eBay and didn't fit. We ended talking and in previous conversations she mentioned she was a pagan and going start female drum circle at some point, so I asked if she ever had one could I attend. When I arrived at the Metrocentre, my first port of call was into TK Maxx to look for more Halloween stuff; I ended up buying more Halloween cookie cutters and a new storage box for baking equipment from Poundland. I went food shopping for tea and to get ingredients to bake scones. 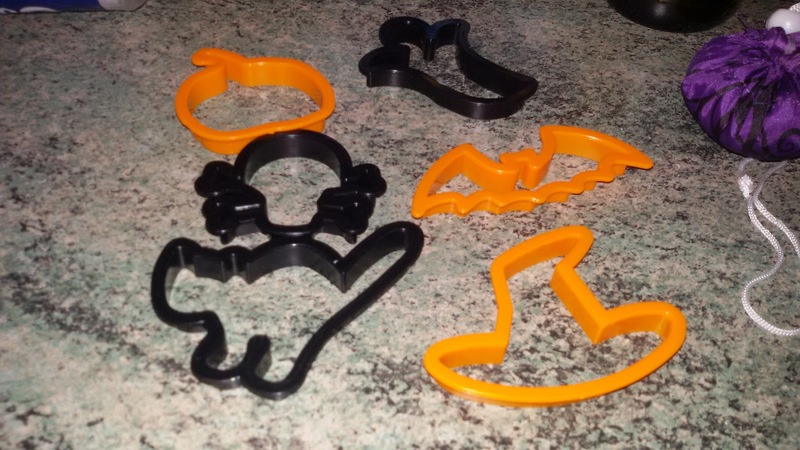 I even went into Asda and bought more, you guessed it Halloween cookie cutters. When I got back, the boyfriend was feeling ill, so I made dinner. 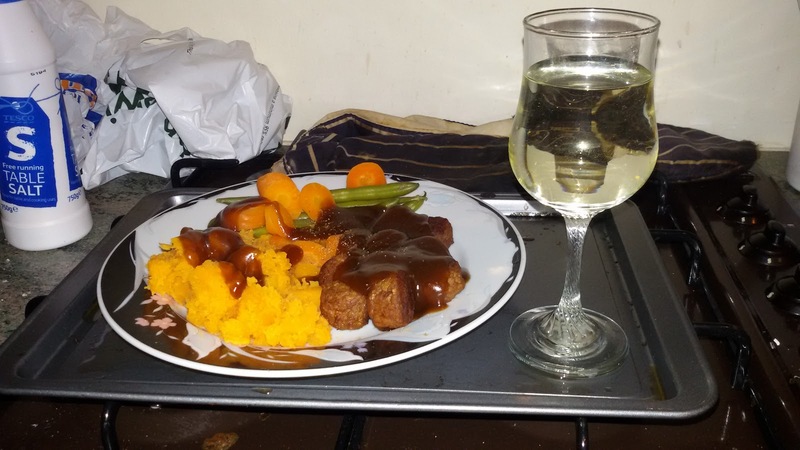 It consisted of Ikea meatballs, mashed sweet potatoes, carrots and bean sprouts that tasted fine, except for my glutenous alcoholic gravy. 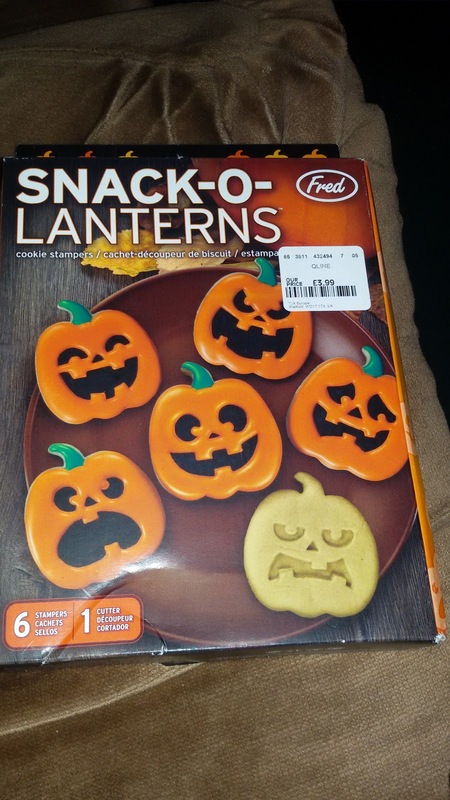 I added some bourbon to enhance the flavor and added too much gravy, it tasted vile. I enjoyed my meal with a glass of Lindisfarne Mead. Today has been a quiet day, consisting of doing house, making dinner and baking cherry scones. 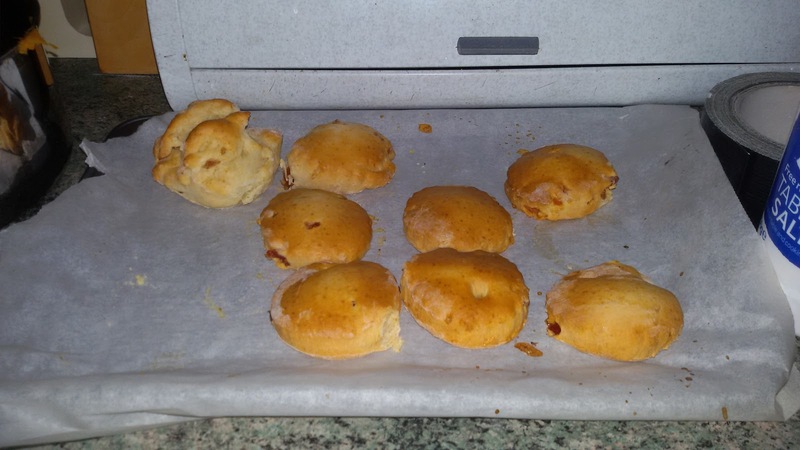 The scones haven't raised properly, but my first batch tasted ok so, I'll need to keep practicing. It felt great to feel like me again, as it's been a while since I've worn makeup or my new rocks. Every weekend most of my outfits have been fat pants and trainer with long sleeved tops, not exciting. Those boots are great. Love your outfit! Thanks, most of it came second hand, lol. My boots are New Rocks I've had for about eight years and unfortunately, the photo doesn't show my metal heels. This weekend was v. busy, and I was hoping for a nice quiet weekend, maybe next weekend. I completely agree, I am trying to keep Sundays as my chill out days this month is going to be a busy month as well in two weeks time I have a conference to attend for the charity I volunteer for. Enjoy your commute.